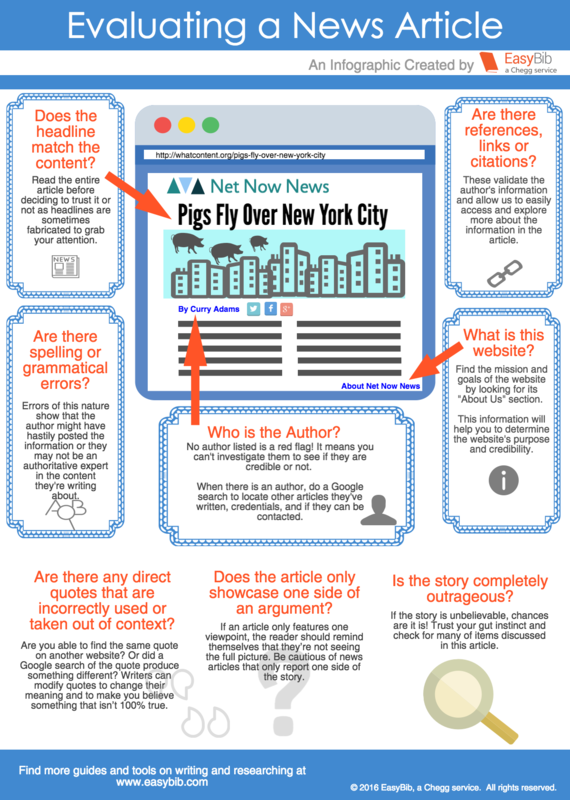 What is "fake news" and how can I evaluate news headlines? - Ask Us! Q. What is "fake news" and how can I evaluate news headlines? Fake news is exactly what it sounds like: stories that are made up to mislead anyone who reads them. You'll need to be extra careful to avoid fake news when you're working on research assignments for your classes, of course. Your instructors expect you to use credible sources at all times. But, even outside of class, you owe it to yourself to take time to critically evaluate the headlines that you see on Twitter, Google, or anywhere else. Don't fall victim to fake news! Fake news stories can look and sound convincing at first glance. Luckily, once you know what to look for, it's easy to spot the difference between real journalism and fakery. The infographic and video below will give you some quick tips.